CJ Katureebe (R) speaks to an official during the open day court. David Okema. GULU. Chief Justice Bart Katureebe has promised to post three judges to Acholi to curb case backlog the subregion faces. The Chief Justice who was presiding over an open court day at Gulu High Court Circuit on Tuesday, said there are serious problems in the circuit because cases overwhelm the few judicial officers at hand. 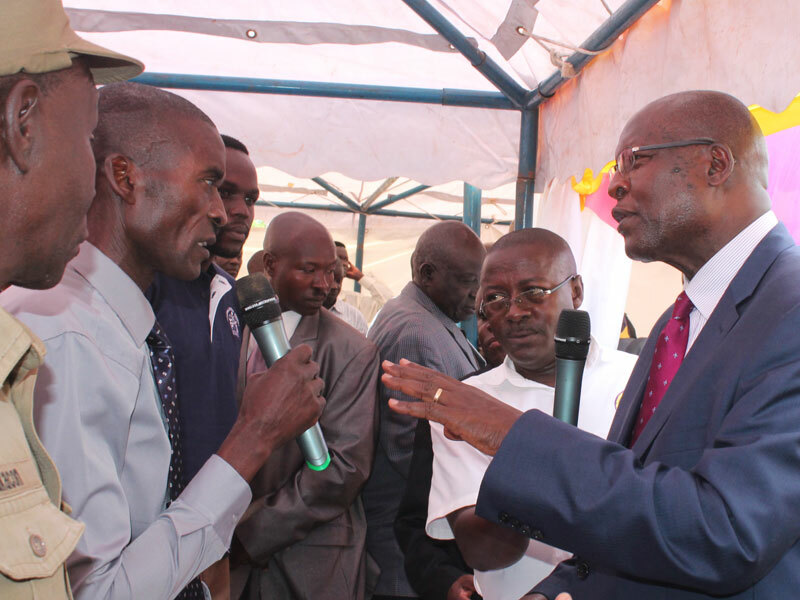 Katureebe said, effective Monday, the Judicial Service Commission will start recruitment of new judges and he promised to post two to Gulu and another to Kitgum after they are adopted into the system. Gulu Resident Judge Vincent Okwonga blamed the high case backlog to limited funds and understaffing that he said delay court procedure in the subregion. Currently, Gulu high Court Circuit, which handles cases of eight districts of Gulu, Amuru, Lamwo, Nwoya, Agago, Pader, Omoro and Kitgum are being served by only one resident judge, one chief magistrate, and only four grade one magistrates, leaving the circuit overwhelmed. Judge Okwonga said over 500 committed cases pending trial at Gulu High Court are delayed due to limited funds. He said the Sh1 million allocated to facilitate each case in not enough for all the court procedures on a monthly basis. The circuit is weighed down with 109 criminal appeals, 213 civil suits, 322 mass lenient cases, 159 civil appeals, 47 administrative cases and an election petition case. Fifty criminal cases before the circuit are under high court, 40 of which have been heard pending judgment. Judge Okwonga urged the Government to increase financial facilitation to court cases to meet demands. Gulu Chief Magistrate Deogratius Ssejjemba concurred with the resident judge, adding that support staff in the circuit is so wanting to the extent that some magistrates do not have language interpreters during court session. Meanwhile, Gulu Resident District Commissioner, Santo Okot Lapolo, blamed the meagre facilitate for reducing judicial officers to ‘corridor magistrates,’ a common euphemism in the subregion. “These corridor magistrates don’t only steal money but keep delaying cases because they want money, and this is causing case backlog,” Okot said. “We must get rid of this corridor magistrate syndrome fast. They are picking money from our very poor litigants who are seeking justice,” the RDC added, warning that he would compile the names of officials involved in the vice and forward them to the Judicial Service Commission for disciplinary action. However, not all the officials held the view that funding was hampering judicial process as, when Patrick Lumumba Oola got his chance to speak, he said funding was not to blame. “My daughter was defiled by a director of a school four years ago. Nothing happened. No justice. The case was dropped. I was instead accused of plotting to kill the director. Can you imagine the judge told me that defilement case is not important?” Oola said. He eulogised Lady Justice Margaret Mutonyi, the former Gulu Resident Judge.